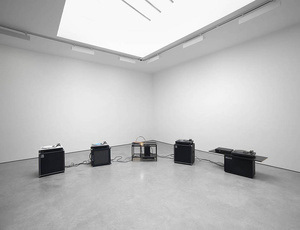 Haroon Mirza has won international acclaim for installations that test the interplay and friction between sound and light waves and electric current. He devises kinetic sculptures, performances and immersive installations, such as The National Apavillion of Then and Now (2011) – an anechoic chamber with a circle of light that grows brighter in response to increasing drone, and completely dark when there is silence. An advocate of interference (in the sense of electro-acoustic or radio disruption), he creates situations that purposefully cross wires. He describes his role as a composer, manipulating electricity, a live, invisible and volatile phenomenon, to make it dance to a different tune and calling on instruments as varied as household electronics, vinyl and turntables, LEDs, furniture, video footage and existing artworks to behave differently. Processes are left exposed and sounds occupy space in an unruly way, testing codes of conduct and charging the atmosphere. Mirza asks us to reconsider the perceptual distinctions between noise, sound and music, and draws into question the categorisation of cultural forms. "All music is organised sound or organised noise," he says. "So as long as you’re organising acoustic material, it’s just the perception and the context that defines it as music or noise or sound or just a nuisance" (2013). Haroon Mirza was born in 1977 in London where he lives and works. He has a BA in Painting from Winchester School of Art, an MA in Design Critical Practice and Theory from Goldsmiths College (2006) and an MA in Fine Art from Chelsea College of Art and Design (2007). Recent solo exhibitions have been held at Ikon, Birmingham, UK (2018); Asian Art Museum, San Francisco, CA, USA (2018); Nikolaj Kunsthal, Copenhagen, Denmark (2018); Zabludowicz Collection, London, UK (2017); LiFE, Saint-Nazaire, France (2017); Contemporary Art Gallery, Vancouver, BC, Canada (2017); Summerhall, Edinburgh, UK (2016); Pivô, São Paulo, Brazil (2016); Nam June Paik Center, Seoul, South Korea (2015); Matadero, Madrid, Spain (2015); Museum Tinguely, Basel, Switzerland (2015); Museum Haus Konstruktiv, Zurich, Switzerland (2014); Le Corbusier’s Villa Savoye, Poissy, France (2014); IMMA, Dublin, Ireland (2014); Le Grand Café, Saint-Nazaire, France (2014); The Hepworth, Wakefield, UK (2013); MIMA, Middlesbrough, UK (2013); The New Museum, New York, NY, USA (2012); Kunst Halle Sankt Gallen, St Gallen, Switzerland (2012); University of Michigan Museum of Art, Ann Arbor, USA (2012); Camden Arts Centre, London, UK (2011) and A-Foundation, Liverpool, UK (2009). His work was included in the 7th Shenzhen Sculpture Biennale, China (2012) and the 54th Venice Biennale, Italy (2011), where he was awarded the Silver Lion. He was awarded the Northern Art Prize in 2011, the DAIWA Foundation Art Prize in 2012, the Zurich Art Prize in 2013, the Nam June Paik Art Center Prize in 2014, the Calder Art Prize in 2015 and the COLLIDE International Award in 2017 which has given place to a two-month residency at CERN, Switzerland in the course of 2018. In the spring this same year, Haroon Mirza unveiled 'Stone Circle', a large-scale outdoor sculpture commissioned by Ballroom Marfa, Texas, which will remain in the landscape for five years. Mixed media 70 x 65 x 30 cm / 27 5/8 x 25 5/8 x 11 7/8 in. Mixed media 172 x 149 x 25 cm / 67 3/4 x 58 5/8 x 9 7/8 in. 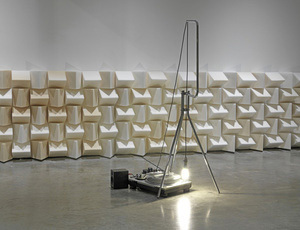 hrm199: Haroon Mirza & Francesca Fornasari, feat. Nik Void & Tim Burgess. Mixed media Dimensions variable Installation view of the exhibition /\/\/\ /\/\/\. Production LiFE – Ville de Saint‐Nazaire, off‐site programme by Le Grand Café – contemporary art centre, Saint‐Nazaire, France, 2017. Photographer Marc Domage. Addressable LED’s, wire, copper tape, aluminium, microcontroller and microphone cable on anodised aluminium 140.8 x 140.8 x 2.5 cm / 55 3/8 x 55 3/8 x 1 in. Lamps, transistor radios, tables, PA system, projector, wooden screen 4 x 7 ft with LEDs, control box, speaker cone, wood, metal stand, light bulb, glass cabinet, cabling, remote controlled socket, electronics Dimensions variable Installation view from Le Grand Café, St Nazaire, France. © Haroon Mirza; Courtesy Le Grand Café. 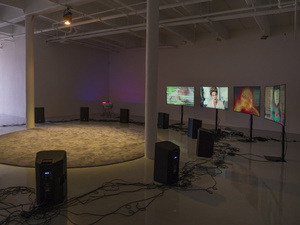 Modified Marshall cabs, LEDs, bespoke media device, XLR4 cables, score Installation view of 'Haroon Mirza: A C I D G E S T', Pérez Art Museum Miami, US July 21, 2017 – May 20, 2018. Courtesy Pérez Art Museum Miami, photography Oriol Tarridas. Collaboration with Mattia Bosco. Nero Portoro stone, LED tape, amp, speaker, Arduino, microphone cable 90 x 60 x 60 cm / 35 3/8 x 23 5/8 x 23 5/8 in.